Tall grasses serve as a refuge for animals and insects in lake areas. Many tall grasses grow on the lake's edge, while some are emergent, or plants with underwater root systems that rise above the water's surface. In North America, however, some tall grasses face the danger of being choked out by invasive tall grasses, or non-native grasses. Cattails are emergent grasses found throughout North America. The blue maidencane (Amphicarpum muhlenbergianum) grows up to 3 feet tall and features 4-inch-long, lance-shaped leaf blades. As its name suggests, blue maidencane grass' blades are bluish-green. Blue maidencanes grow near the edge of lakes and offer nourishment to wildlife such as white-tailed deer. This grass occurs around lakes in the Southeastern United States, primarily Florida and Georgia. Other states with blue maidencane are Alabama, North Carolina and South Carolina. Cattails (Typha latifolia) are emergent plants found in lakes throughout the eastern United States. The tallest cattails reach heights of 10 feet. This grass receives its name from the brown seed heads at the top of the grass blades; these seed heads form in the summer and early autumn. Cattails provide shelter for wildlife such as fish, insects, reptiles and amphibians. 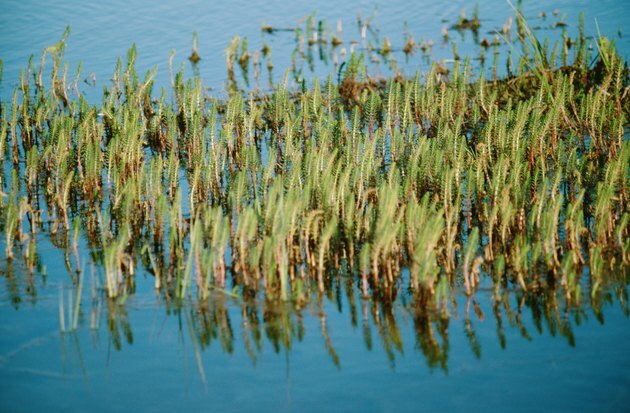 This plant's method of seed dispersal results in a rapid increase of cattails in a lake. At full maturity, common reed grass (Phragmites australis) grows up from 3 to 15 feet tall. This grass dwells in wetland habitats, especially near alkaline and brackish waters such as lake shores, riparian areas and marshes. Common reed grass is native to Europe, but was introduced to the United States during the 20th century. Currently, common reed grass grows in most states in the continental United States. Native throughout North America, the little bluestem (Schizachyrium scoparium) grows up to 3 feet in deep, fertile soils. This grass begins to grow during the spring and continues it growth until the first frost in late autumn and winter. Deer, cattle and birds eat little bluestem as a part of their diets. Little bluestem grows around lakes, but is also see in pastures; this grass is commonly cut for hay. Also known as Hymenachne amplexicaulis, the West Indian marsh grass is native to islands in the Caribbean Sea and is seen in tropical climates throughout the Southeastern United States. West Indian marsh grass grows over 3 feet tall and usually grows in moist pastures and near lake shores. This invasive species threatens to displace the blue maidencane and other native grasses in the United States.